Advantages of Vinyl Siding - Performance Roofing, Inc.Performance Roofing, Inc.
Vinyl siding has been the most popular choice of siding products on American home’s since being introduced to the market in the 1940s. Performance Roofing chooses to install vinyl siding on our customers’ homes because of the many advantages it delivers in terms of beauty, convenience, energy savings and long-term value. DO YOU KNOW THE TRUE COST OF PAINTING YOUR HOME? One of the most significant advantages of vinyl siding is the elimination of the need to paint your home’s exterior every few years. The cost savings are greater than you might imagine. *Assuming a modest 3% inflation rate. Can you afford to spend more than $50,000 just to keep your home’s exterior looking good? 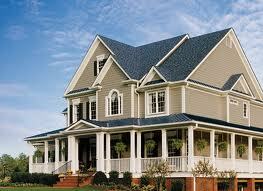 Durable, low-maintenance vinyl siding from Performance Roofing is an excellent option.